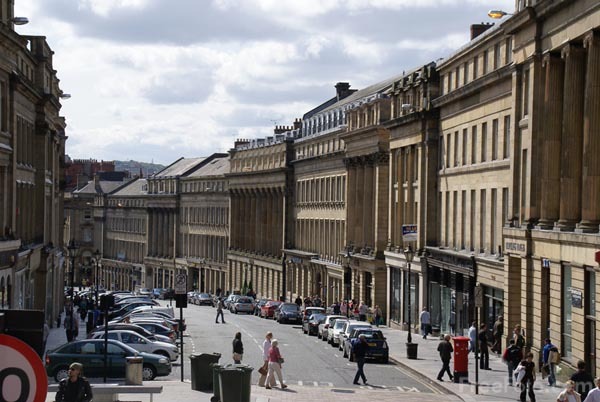 Photographs of Grey Street in Newcastle upon Tyne. The classical features of Grey Street are of particular note. Built of local stone block in a typical regency style it was designed by John Dobson and Richard Grainger in 1830. The street was once described by the Prime Minister, Gladstone in 1862 as our best modern street. Sir John Betjeman also said As for the curve of Grey Street, I shall never forget seeing it to perfection, traffic-less on a misty Sunday morning. Not even Regent Street, even old Regent Street London, can compare with that descending subtle curve. Grey Street is named after the British Prime minister Earl Grey (1830-34), whose monument stands at the head of the street. Earl Grey, a Northumbrian by birth, was the Prime Minister at the time of the Reform Bill of 1832. VIEW: More images from the category Grey Street, Newcastle upon Tyne or taken at the same location or around the same time .